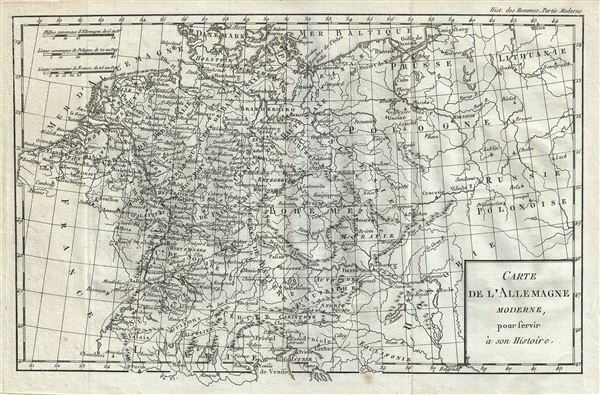 A fine 1782 map of Germany and Poland by Jean- Baptiste-Claude Delisle de Sales. The map covers Germanic territories from the Baltic Sea to the Gulf of Venice and from France to Russia. Includes Germany, Austria, Bohemia (Czech Republic), Poland, Lithuania, Prussia, Switzerland, Holland (the Netherlands), Belgium and Denmark. The map offers an extraordinary level of detail throughout, noting numerous towns, cities, rivers, roads and other topography, with mountains beautifully rendered in profile. Notes the imperial circles of Germany. The 'imperial circles,' covering most of what is now Central Europe, were administrative units created for tax and defense purposes by the Holy Roman Empire in the 1500s. The Napoleonic Wars would, of course, dissolve the Holy Roman Empire and lead to the consolidation of Germany in 1871. Very good. Minor wear along original fold lines. Original platemark visible. Minor spotting in bottom margin. Blank on verso.